The egg Margaret turns into was a reused prop from the second episode, "The End of the World". I may be a sucker, but I thought the loo scene was quite poignant and unexpected. Nine years on and I'm still sad this is the only non-crisis episode with Nine/Rose/Jack(/Mickey) as a fully cohesive Team TARDIS. It's a testament to the skill and chemistry of the actors that the "parting of the ways" only a couple of episodes later is so poignant. This is one of my favorite episodes because it is a complete mess, yet accomplishes so much! 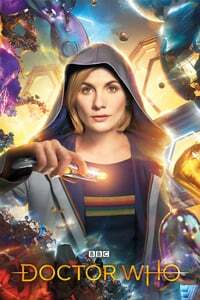 What there is of the story doesn’t make much sense - a Slitheen masquerading as a human becomes mayor of Cardiff and has her plans to build a nuclear power station in the center of town approved only six months after Aliens of London/World War III. Despite that premise, Davies manages to make the Slitheen sympathetic, cuts to the heart of the Doctor’s guilt over the Time War, establishes the modern time rift in Cardiff (setting the stage for Torchwood), makes the Doctor and Rose aware of Bad Wolf, has those great alternating scenes of the parrying Blon Fel-Fotch and Doctor in the restaurant and Rose/Mickey getting re-acquainted on the wharf, and foreshadows the power of looking into the heart of the TARDIS. Fun fact: The original author for this episode couldn’t contribute a script so RTD started writing what would eventually become “The Fires of Pompeii” as a replacement. But, he was so impressed with Annette Badland as the Blon Fel-Fotch Pasameer-Day Slitheen in AoL/WWIII that he set aside his Pompeii script and wrote this story to bring her back. There's really a lot to like about "Boom Town" but my favorite thing is how it feels very much like "the cheap episode" from the first new season (not quite a bottle episode but not pretty close) when they didn't know if the show yet if the show really had a future but they still managed to pull out something neat -- which is Classic Who -- but then it also has some of the best kind of character work that is more a hallmark of the 21st century show. I understand why the Slitheen will never be redeemable as an acceptable villain for some folks, but Blon Fel-Fotch Passameer-Day in Margaret Blaine's skin comes as close as you could imagine. I watched this right after "The Doctor Dances" and that might have been a mistake. This episode was such a let-down by comparison. I did like that they brought back the "adventure" music motif from the first episode for the chase scene. The neat thing about this episode is how the heart of it is just a bunch of genuine conversations. NuWho never gets to breathe quite like this, and using it to have the villain (who is every bit a maniacal villain here) make the case for her reprieve from execution, while fleshing out Rose and Mickey, was a nice thing. Nowhere near my favorite episode but on rewatch this weekend I gained a lot more appreciation for it.